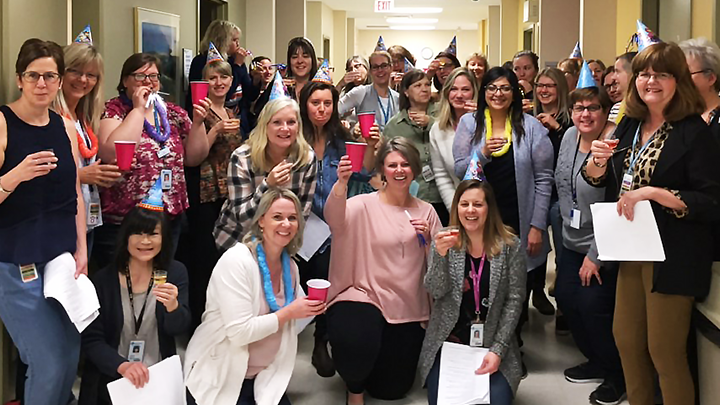 Members of South Calgary Health Centre School and Well Child Team, Public Health celebrate the migration of AHS public health records to Meditech in the Calgary Zone. CALGARY — Public health records from across Alberta Health Services (AHS) are now stored on the same clinical information system (CIS) following completion of the Calgary Zone’s transition to Meditech last month. Over the past two years, patient records and immunization information were migrated from the Calgary and Edmonton zones’ previous systems to Meditech. Amending more than 500,000 patient records. Electronically and manually converting 2.8 million patient records (1.6 million in Calgary, 1.2 million in Edmonton). Transferring 31 million immunization records (17 million in Calgary, 14 million in Edmonton). “It’s exciting and extremely satisfying to see this collaboration between the clinical business and IT come to fruition,” says Shelly Philley, Director, Public Health, Calgary Zone. Public health, communicable disease control, travellers’ health and community oral health are among the Calgary Zone teams now using Meditech. With the Calgary Zone transition, public health operations in all five AHS zones are now using the same CIS with consistent assessment tools, reports, and clinical workflows. Transitioning to Meditech enables consistent practices across public health and associated clinical programs in Alberta, improving the consistency of care for AHS patients and their families. It also provides staff with critical information from across AHS needed to evaluate decisions as well as improve provincial and national reporting.